Robby Barbaro is co-founder of Mastering Diabetes and co-author of the of the upcoming book Mastering Diabetes (Avery Publishing Group). He is a diabetes coach, educator, and international speaker who has been living with type 1 diabetes for more than nineteen years. Since 2006, Robby has used an evidence-based approach to his personal health and fitness, built on a foundation of low-fat, plant-based, whole-food nutrition. Using the Mastering Diabetes Method, he has seen his insulin sensitivity improve by 600 percent and his overall health improve dramatically. 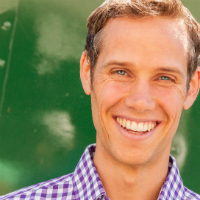 His personal experience sparked a passionate interest in learning as much as possible about nutrition-driven wellness, a quest that led Robby to devote six years to building the revolutionary Forks Over Knives empire, alongside the founder and president. In 2016, Robby turned his full-time attention to Mastering Diabetes, which offers a revolutionary online coaching program that is helping thousands reverse insulin resistance, gain energy, and significantly reduce chronic disease risk. A graduate of the University of Florida, Robby is currently pursuing a master's degree in public health from American Public University. Recognized widely for his colorful, fruit-inspired Instagram photos and recipes, Robby documents his daily diet and lifestyle on Instagram Stories (@mindfuldiabeticrobby).